The latest SPARC Innovator Award was announced yesterday and (we must admit it’s hard to hide the joy) – it’s RIO! SPARC (the Scholarly Publishing and Academic Resources Coalition) is a global coalition committed to making Open the default for research and education. Their bi-annual Innovator Award goes to individuals and initiatives who dare to challenge the status quo in scholarly communication. As SPARC Innovators, we join a prestigious club of awardees including the OA Button, the authors of the Panton Principles and the San Francisco Declaration on Research Assessment (DORA) as well as PLOS ONE, the Bill & Melinda Gates Foundation, the Health Research Alliance and the World Bank, to name just a few. But what is more substantial for us is this recognition from a community-focused organisation that aligns with our principles of openness and transparency in scholarly communication. From the very start, we believed in the potential of RIO. Now, we have official recognition that our project has the spark of innovation to challenge the status quo and to introduce a new dimension of openness into scholarly communication. From the very start RIO was set to innovate traditional science publishing practices by opening up for publications from across the research cycle. Our list of publication types includes Ideas, Grant Proposals, methods, Data, PhD Project Plans, Project Reports and Communication Briefs. By publishing results from every step of the research life-span, we hoped not only to provide authors an opportunity to get credit for their efforts, but also to introduce a publishing environment that ensures maximum transparency and encourages exchange of ideas and expertise. Special functionality allows linking each published output to UN’s Sustainable Development Goals (SDGs) to map its social relevance and promote interdisciplinary research. To add to this mix, we also installed a transparent multi-option peer-review process, including options for author-supplier pre-submission and public post-publication peer-reviews. All these options are available in a unique online XML-based collaborative writing, reviewing, editing and publishing environment powered by our ARPHA Publishing Platform. 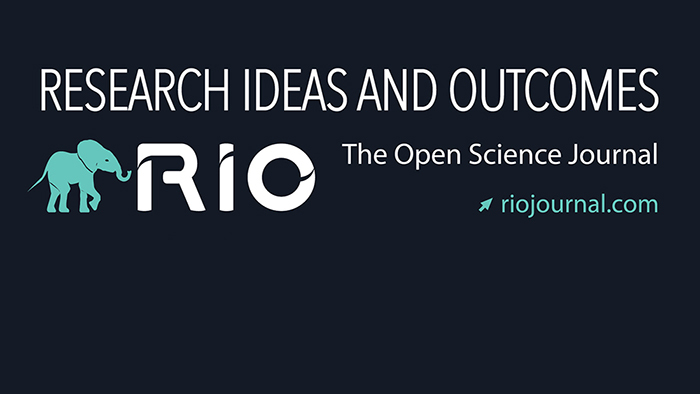 When we first announced RIO in September 2015, we promised the community a one-of-a-kind innovative journal. Since then, we’ve had many people believe in us and show us their support by joining our Advisory and Editorial Boards and, of course, by publishing with us too. We want to express our thanks for all of the support and trust our editors, authors, reviewers, readers, and others offered us from the very beginning.